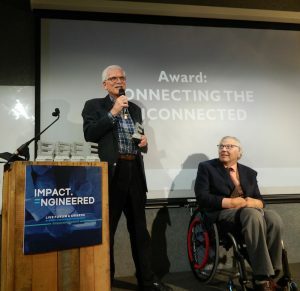 On October 18, 2017 Inveneo had the honor of receiving the “Connecting the Unconnected” award from Engineering for Change and ASME (The American Society of Mechanical Engineers) at the recent Impact.Engineered event held in New York City. 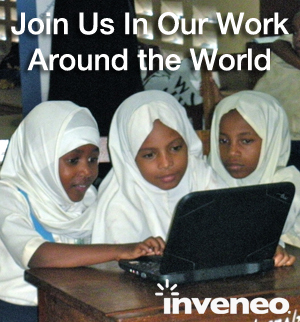 The IEEE – SA Global Affairs Program Director Moira Patterson presented Inveneo with the award, describing the incredible impact Inveneo has brought to many rural and previously unconnected communities around the world. Co-Founder and Executive Director Robert Marsh received the award for Inveneo. Co-Founder and current Executive Director Robert Marsh represented Inveneo and received the award for the team. As he was on stage he announced that, “when [I was] told about the event, I said I might not be there because I’ll be in Liberia connected the unconnected” which brought great laughter from the audience. The award from ASME and Engineering for Change. 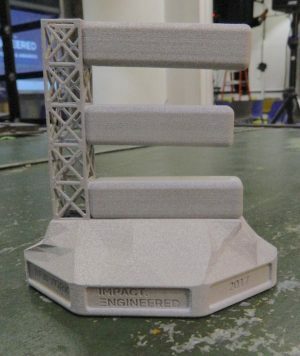 The Inveneo team would like to congratulate all the winners at the event and say a special thank you to the ASME and Engineering for Change teams for the award. It was an exceptional evening and several past Inveneo employees were also present, including Wayan Vota and Mariela Machado, who continue to make incredible contributions in the ICT world!